Spend enough time around mechanical conveyances designed by human beings and sooner or later something will go wrong. I think it's in our DNA, given that the body and mind eventually fail, so too will everything we create or produce. A heartwarming thought, that. It gets better. If you become one of the idiotic egomaniacs that chooses to race these man-made machines the lesson becomes readily apparent that not only will they fail, but they will generally do it at the worst possible time. This is what happened to me, six days before the first race of the season. Rebuilt top end with less than 15 hours on it, without warning, something lets go. Carnage ensues. 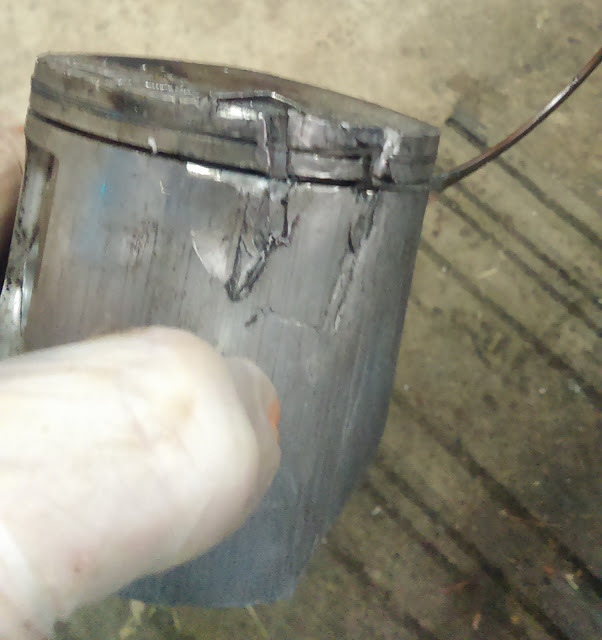 Cylinder, head, piston trashed. Crankshaft questionable. Cletus, I don't think dat fucker is supposed to look like dat! !